Joseph’s Wine Bar & Café offers a wide array of wines, a full service liquor bar and Mediterranean-inspired dishes. With an intimate and classy ambiance and a quiet atmosphere, the restaurant is ideal for a meal with close friends and family or for a date with a loved one. Joseph’s Wine Bar & Café boasts over 2,000 bottles of wine and an extensive selection of wine by the glass as well. Come join our family and enjoy a wonderful dining experience. A great place off the avenue. Food was wonderful and perfectly prepared. The staff were enthusiastic, knowledgeable, and were genuinely passionate about their offerings. Very enjoyable. Just too noisy. Owners very accommodating!!! We where on vacation and a friend who lives in Delray recommended it. Off the beaten path of Atlantic, nice Alfresco dining or inside. Food is wonderful. My husband got the Duck special and loved it. I had taboulli salad and it was very good also. Will definitely be back. Lovely family owned. Delicious fish. No feeling of being rushed. A neighborhood gem! Loved everything about Joseph's. Went on recommendation and so glad we did. We were greeted warmly by Joseph and seated right away. His son was extremely knowledgeable about all the wines and gave great advice for pairings. We had the Mediterranean Turnover which was delicious, the lamb chops, which were as good as my friend said and the steak special. Did not disappoint. Will go back for sure. This place is a great local find! Food is excellent. Escargots like I've never had before and their duck is superb. We've been back 3 or 4 times and have tried different items on the menu and they're all superb. Most of all, Romi, the hostess and daughter of the owner makes the experience special. She's charming, knows her wines, recognized us the second time we went, and remembered our names (somehow) and treated us as though we were regulars. Which, of course, is the hallmark of a great local establishment..where everybody knows your name. It's our new "go to" at least once a week. From the moment we were warmly greeted at the door by Joseph’s daughter, to the great drinks made for us by Joseph’s daughter, to the wonderful meal and conversation provided by Joseph himself, we felt like we were invited for fine dining at a friend’s home. The service and food at Joseph’s is always outstanding. They go out of their way to make you feel welcome. Ellie, the son always makes a point of greeting us by name, and helped me with the menu choice, as I am diabetic. Wonderful. The restaurant is a family owned and operated business. During our dinner we meet them all, and it was the most refreshing experience I have had dining in a long time. A wonderful small restaurant with great Lebanese cuisine. Superb wine list. Love to dine here. Always excellent quality food cooked by the owner's wife who is not only an excellent chef but creates and makes all of the divine desserts. Cordial, friendly (not stuff like other upscale restaurants), moderately priced for the area. Consistently a great dining experience! We have not been to Joseph’s in five years. we are back to stay! what a fabulous meal and genuine family service. Great as usual...Family makes you feel at home and part of theirs!!! Great wine list and one of the best Manhattan drinks ever made! We eat here often. Menu and specials never change. Their attitude is if it ain't broke don't fix it. All appetizers and entrees are superb. Their duck is the best in town. I highly recommend. We vacation in the Delray area the past two years and this was our third time at Joseph's and we have never been disappointed. 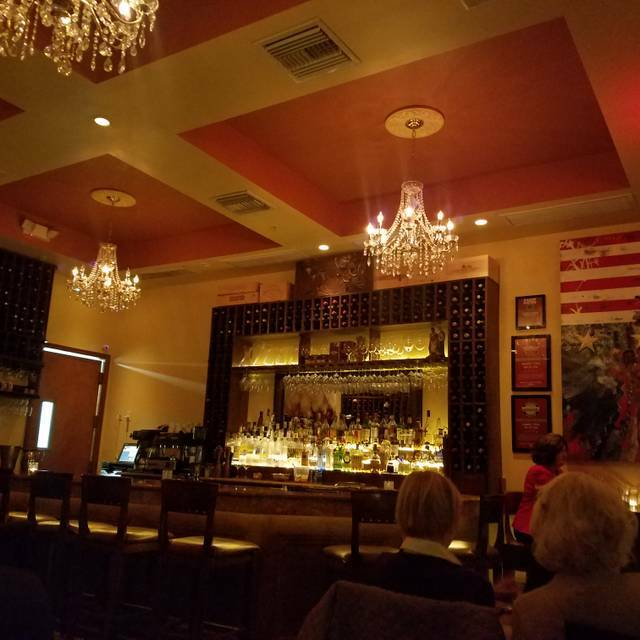 Located in the Pineapple Grove area of Delray away from the crowded Atlantic Avenue, it is a family-run restaurant - Joseph greets people, his son and daughter are the servers and his wife in the kitchen -- and it shows in the ambience and attention to detail. The menu is a mixture of Mediterranean and other cuisines and we have not had a bad dish yet. Highly recommend the grape leaves and greek salad for appetizers. My wife had the sashimi tuna which was amazing and I had the salmon which was cooked in a light crust which I usually do not like but this was delicious. We skipped desserts so I can't comment but we did have cappuccinos which were excellent. We had a great time at Joseph's. It is a small and intimate place, the service is outstanding, the food excellent. They were accommodating to my dietary needs, and the tuna sashimi was a very generous portion. We will definitely return. Huge surprise. Friendly, family run and everything was delicious. Great spot for a memorable meal. Excellent service and food. Superb meal. No false steps. Flawless. Home cooking meets haute cuisine. Great wines and great recommendations for pairings. Joseph the owner host is warm and welcoming. His wife the chef and the staff prepare, present and serve delicious meals. I have been to Joseph’s Wine Bar several times over the past few years. The ambiance is is just lovely. The food is really the best that I have eaten in Delray. The service is warm, personable and engaging. It’s a family run business and each family member seems invested in making sure you come back. My dinner was finger licking good from beginning to end. Bravo to Joseph and his family for his standout dining experience! I can’t wait to go back. Like every visit to Joseph's Wine Bar & Cafe it was again very good food, pleasant service and had a good time. The owners are lovely people. Excellent steak au poivre. Terrific tiramisu. Excellent wine list. Very warm and friendly atmosphere. Terrific food,staff,chefs.Every detail of a dining experience was thoughtfully taken care of.The knowledge of their food and beverages was outstanding. Just Terrific here. From start to finish. One of the best meals around! Whenever we return to Delray the first restaurant we go to is Joseph's. The food is always wonderful. Service is excellent. You feel like you are visiting family. There is an amazing wine selection. Canceled our hard to get reservation to Buccan to join Joseph and his family with our friends...and we were not disappointed. We’ve been walking by Joseph’s for many years, every time saying the same thing: we should stop by and check it out. We did and would like to hope that there will be a table for us when we return. Wine list is good, but the most impressive was the bartender. He didn’t have exact ingredients for one of our favorite and somewhat common cocktail. He asked a couple of questions. He listened. He understood and ...created a perfect new favorite! We asked him to repeat and he did. Food was delicious from the Mediterranean platter and other shareables to one of the ducks that I ever had. We were in a companyod a professional chef with engineering degree in food preparation and his own amazing creations. Even he admitted (and I concur since I was allowed to try) that Joseph’s rack of lamb deserves the highest marks. Even boring salmon was so good that it was not offered by one of us to share with others...not even a little taste...very suspicious or simply that well prepared. Overall a menu where chef doesn’t over think but executes everything to perfection. This is a lovely place which features a nice wine and cocktail selection and serves a nice array of food choices. The owners are great and the outdoor street seating is great for South Florida. A definite cool locale. Wonderful family dedicated to great food and outstanding service! We have been following the success of this family-owned business for about years. They are a Lebanese family who deliver delicious food night after night. We brought friends who had never been who live in Boynton. It was a lovely night for sitting outside! We each had something different. The daughter is adorable and knowledgable! Our friend was so impressed that there was no TV at the wine bar itself. Conversation is not dead!